Aza Ray has had trouble breathing since birth. The doctors said she wouldn’t survive a year. Her mother was determined to keep her precious girl alive but drug concoctions have side effects. When fifteen year old Aza sees a ship in the clouds, hallucinations are added to the list of medical side-effects. Then the unthinkable happens. The first part of Magonia seems so normal, the jump into magic realism is a shock. It’s true there are hints of what is to come but Maria Dahvana Headley’s gift at creating completely believable worlds makes the transition difficult. If you can suspend your disbelief for the few pages in which the real and fantasy worlds collide, you are in for an action-filled ride. Aza wakes to find she isn’t dead. In fact, in this new world she has powers that can change lives. But does she want this? Everyone who matters has been left behind. Even if they knew where to follow Aza, they wouldn’t survive the journey. Is there a way to traverse two incompatible worlds and survive? Magonia sets up a space where political agendas and power plays interweave with Aza’s struggle to find a place where she can be happy. The upper world could precipitate the earth’s destruction but what if nothing is done? Magonia forced me to keep turning the pages in a bid to find out how this unthinkable conundrum would be resolved. I, like Aza, never expected her best friend Jason to have a role in the ending. 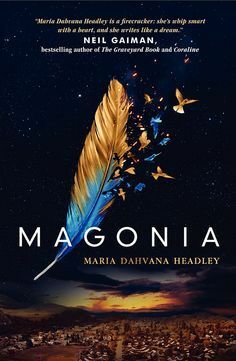 No wonder Magonia was a New York Times Best seller. Suspend your disbelief. It will be worth it.